There was a time, maybe just a decade ago, when ‘Cadbury Purple’ was big news in the wedding world. It was the colour of choice for many brides but then it rather fell out of favour. Other colours, patterns and prints, not to mention the whole rustic and vintage vibe pushed poor purple to one side. However, thanks to our newfound love for jewel tones, amethyst is making a come back. 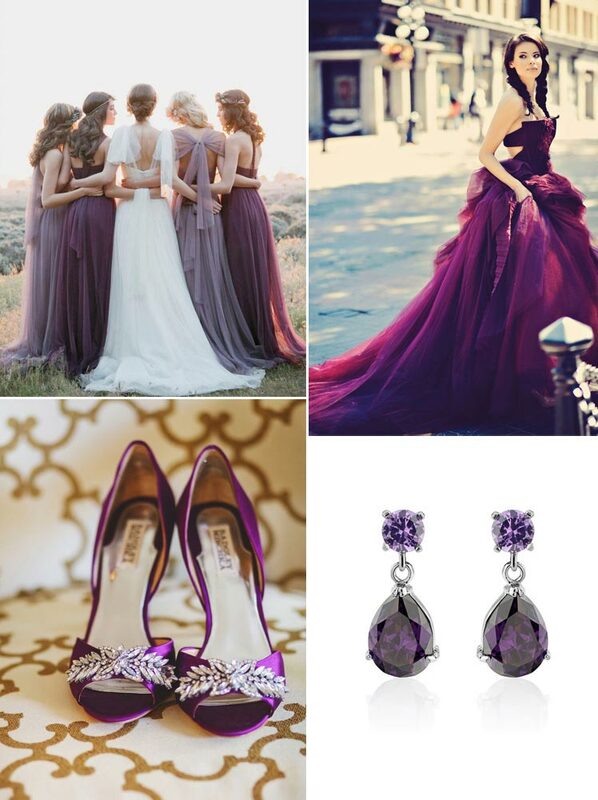 The first place to start with amethyst would naturally be your bridesmaids and their gowns. I love the long-line gowns in the image I’ve picked out and a great detail worth noting here is the light fabric that’s been chosen for the dresses – this stops the colour being too heavy and lightens the whole look. There’s also the practical point that a bridesmaid’s dress in this colour could certainly be worn after the wedding day so that’s another tick in the box! A dramatic wedding gown in amethyst certainly makes a statement and if you’ve got the panache to pull this off, I raise a glass to you. The beautiful Vera Wang gown in the image here again uses ethereal fabric to great effect – a shiny satin just wouldn’t work but masses of tulle absolutely does. If a coloured gown isn’t for you, definitely consider amethyst bridal accessories. Obviously, jewellery is a natural choice and the beautiful Glitzy Secrets earrings add both colour and charm to your outfit. I also like the thought of amethyst toned shoes peeping out from under your gown for a touch of individuality and these pretty peep toes with sparkling details again keep the look light and elegant. Florals look amazing in amethyst tones and you’ve got endless options – mix in lilacs, creams, or pinks and don’t forget beautifully scented lavenders or even herbs to provide contrast and interest to your arrangements. As you can seem from these images, planted table centres can look fantastic and, if you’re a green-fingered bride, they allow you to DIY ahead of the big day. Whilst the men at your wedding might baulk at a purple waistcoat, they surely won’t mind a buttonhole to match your scheme? Again add in other materials to up the interest. In terms of other decorations, I love these purple ribbon streamers but you could also opt for paper pompoms, pinwheels, hanging paper lanterns or honeycomb balls in your choice of colours. Stationery could be as simple as plain cards and papers with amethyst ink or there could be colour co-ordinated watercolour paintings, printed patterns or sweet motifs. Let’s finish our look at amethyst inspiration with food and drink. I think the ‘naked cake’ here with the gorgeous flower and fruit decoration would be a fantastic centerpiece and I’m also all for adding little blackberries to desserts and cocktails as the perfect finishing touch. Altogether delightful, just like amethyst.